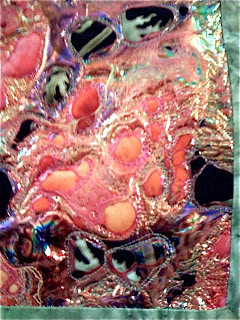 If you love to make fiber art but need a "purpose" to create- I would highly recommend a yahoo group called fiber art traders. I have been involved with them for about a year now and have loved every minute of it. The latest trade is a fiber frenzy trade. The participates are not actually making something but rather trading fibers that we have. What a fantastic idea to share some of the wonderful fibers you have collected and have the opportunity to try a new fiber from a member! These are the fibers from my stash, a few fluffy fun fur, a hand dyed, mixed yarn, ribbon like fiber, really fun white wispy fibers. I have used and love them all. Rick-Rack Bouquet pattern by Moda U. 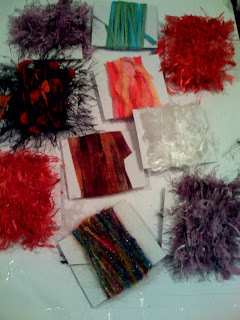 The kit was all moda fabrics and rick rack. The little bouquet was easy to make. You used the three fabric swatches to make the yo yo's and stitch with button in the middle. Then you gather up the moda rick rack to form an outer flower that is then stitched down to the yoyo. Once all three Yo Yo flowers are made you add a few felt leaves and finish it off by stitching it onto a circle that is covered with moda fabrics. 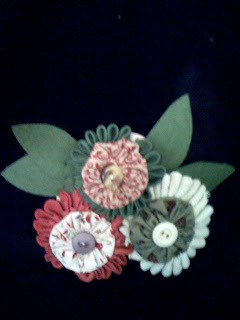 Special note- when you attache the flowers to the circle make sure the fabric side is NOT facing the flowers. I did not notice until after I had sewn them on that the back of my pin is the paper side not the pretty finished floral fabric. Live and learn...right. We are having a tea party meeting for the Garland Guild tomorrow night. 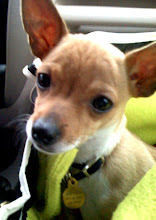 I plan to bring this little pin to suggest as a party favor for the tea party attendees. No offense to moda but I would love to make another with bright fabrics and some tulle. 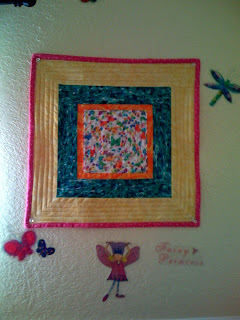 Secret Garden Quilt was made from the most beautiful fat quarter ever! My secret pal in the Garland Quilt Guild gave it to me a few months ago and I have been trying to figure out how I would use it. It was just too pretty to cut! The answer came to me when I read the article in the June/July issue of Quilting Arts Magazine "Lost in the Stash". 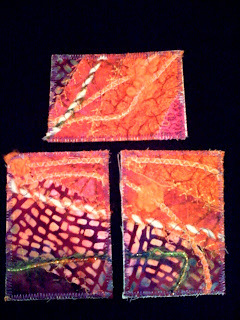 (Not only could I use the fat quarter, but also the packages fusible film from Houston Quilt Show.) 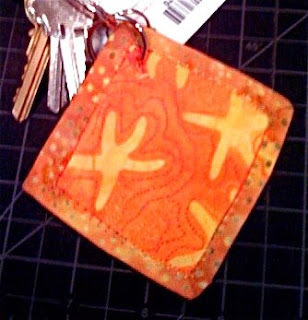 The article gave directions to make a small quilt from a fabric with an image on it that is layered with Angelina fusible film and then embellished. Since the fusible film comes in 4" rolls I cut my mini quilt base 12" square to minimize waste. The quilt in the magazine had many more details too but I wanted to keep mine more simple so that the fabric would still be the highlighted feature of the quilt. The back side of the secret garden quilt is a beautiful piece of hand dyed fabric that I purchased last year at the Garland Guild garage sale for .25. Three beads that I made from the starter kit. While in Houston at the quilt show, there was a lady who had the most exquisite necklace on. A real conversation piece. She told me that a woman a few booths down taught her how to make them at another show that they both had booths at a few months prior. She said that if I asked the vendor nice she might also teach me how to make them. 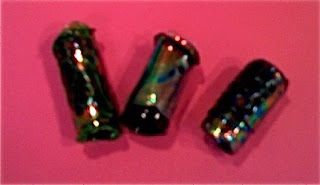 The beads are not as pretty in the photo as they are in person. The bead kit had the supplies to make lots of beads, but unfortunately the smell of the melting vinyl was a little to much for me. I am the kind of person who is really sensitive to smells though so it may not bother someone else. To make the beads you wrap the angelina sheets around the vinyl and heat it with a heat gun in a VERY well ventilated area. You can use either black vinyl as I did in the photo or clear vinyl. I am going to use the clear piece of vinyl to make a new badge holder and will use the extra sheets of angelina in some ATC. 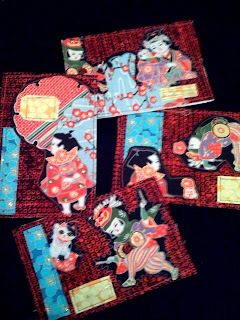 4 Asian themed fabric postcards made to exchange at Postcard Pizzazz. 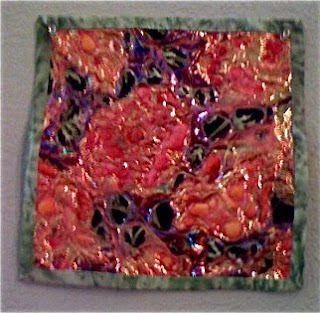 I fell in love with this block it is approximately 14" square. It was made with something like 60 pieces. If you could see it up close you would be just amazed. 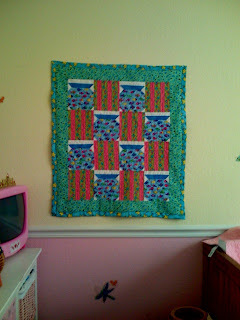 I quilted it with all different stitches with my Husqvarna Viking Designer SE. The SE has an awesome foot that has a spring to make free motion quilting a snap. You just screw on the foot, set your SE for free motion (drops the feed dogs) and select a stitch. The best advise I can give is to hold your thread when you start. This will bring the bobbin thread to the top this seems to produce the prettiest stitches. Also always use a new needle. I enjoyed making this piece. 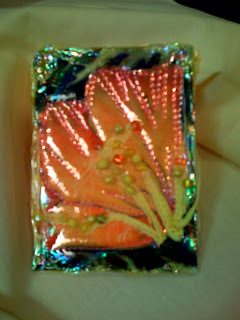 It is a tea box made from a box that I took apart and made a pattern. 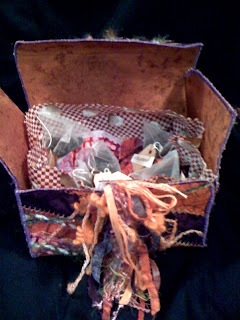 Sewed strips of batik fabrics onto fast to fuse and then assembled a tea box. Inside is a liner bag like you receive in a real tea box. The tea bags have wooden tags that have words on each that were printed out in different fonts. A really fun challenge- can't wait to try the next one. OHHH the 2008 Houston International Quilt Show brochure arrived yesterday...Yay! After reading it cover to cover many times, mom and I registered for our classes. Very Exciting- we went last year and had soooo much fun. 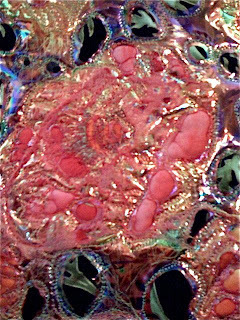 Even though we live just outside of Dallas, this area of North Texas does not really have any shops that specialize in mixed-media or art quilting. The closest shop is in Lewisville (about a hour away each way). So I am embarrassed to say that I went a little crazy buying art quilting kits and supplies that I had NEVER seen before and was afraid I would not see again in my area. 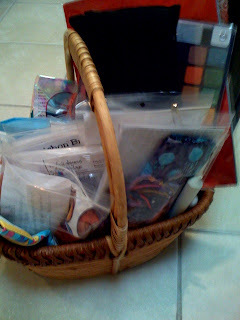 BUT I still have a basket of "kits" and projects that I just HAD to have last year. Herein lies the challenge. For each kit/project that I finish before October 29th (when we leave for the quilt show this year) I can buy another project. But I am going to hold myself to the fact that if I do not finish any that I bought last year...I can't buy any new ones this year. Well here it is. 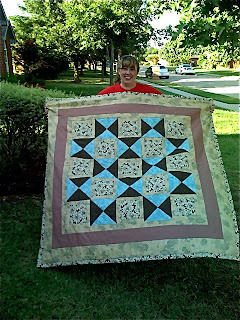 My "big girl quilt" that I made for the Texas Quiltworks challenge. The shop posted a challenge in January where we had to purchase 2 yards of their "mystery" fabric and from that we were suppose to make a quilt (with other fabrics added of course). The mystery fabric was supposed to be a main fabric in the quilt top. 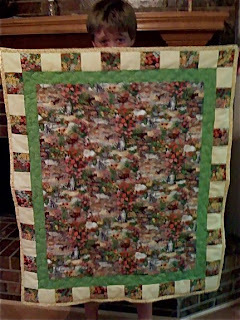 The quilt also had to be quilted and bound. 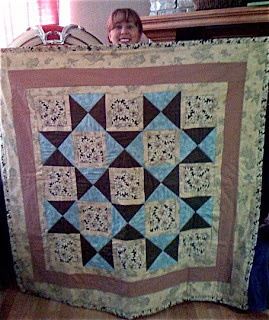 I called this my "big girl" quilt because it is the first good sized quilt ( I prefer to make art quilts and smaller wall hangings) that I pieced, quilted and bound myself. It is not perfect but it was fun to make and I learned a lot about what to do and not to do next time. I am really proud of the binding and piecing but not so proud of the actual quilting. 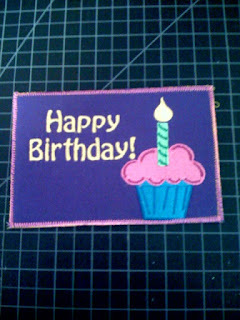 I used the fusible batting, pins and started from the center and worked my way out, but I still had some puckering. But with practice everything gets better. Found some really great fabric at hancock fabrics on clearance that will be perfect for practice. I am going to make some quilt sandwiches and practice with those. I think also when I practice I will use my quilt pounce with an easier stencil until I master that then move to a more detailed one. Live and learn...but at least I tried. 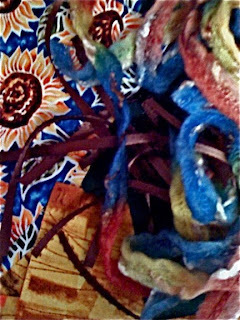 Fibers mailed to the mystery postcard challenge group. I'll post photos of the postcards that I receive made from the materials. The last exchange we did was awesome. 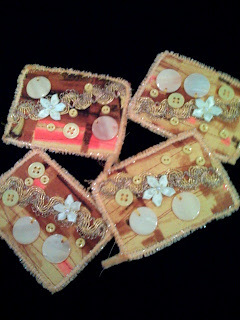 Yellow Quilters Trading Cards made for my exchange partners at postcard pizzazz. When Drew and I drove to San Antonio for the Husqvarna Viking Convention, we decided to stop at a bunch of quilt shops along the way. Drew wants to have a Texas quilt this year for his new bed. We enjoyed the shop in Saledo so much that we stopped there on the way back too. 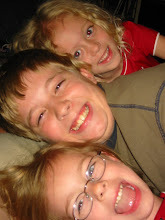 While I was at the convention, Drew stayed at Mimi & Grandpa's house. 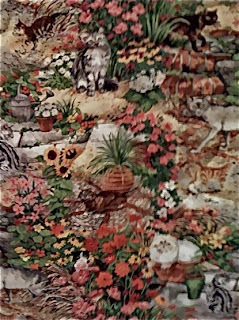 Mimi has a few house cats and is also taking care of a handful of stray cats in the neighborhood so when Drew saw the cat fabric it was a must have for Mimi. Sewn and embroidered with a Husqvarna Viking Designer SE, the embroidered Fabric Postcard made from Cactus Punch Embroidery Design and lettering added with Husqvarna Viking 4D Pro. I used rayon silky threads. Husqvarna Viking 4 D Professional software has a security dongle that comes with the program. In order to access the 4D programs you activate the dongle and must have the dongle inserted into the USB port in your computer to run the software. The top corner of the dongle has a plastic hole that you can attach a key ring. So I figured why use a standard key chain right when we have a great opportunity to be creative! 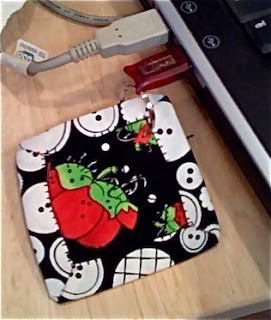 Why not make a dongle keeper or key chain holder. These are fantastic to have when taking classes with other folks that are also using software with dongles. What a bummer it would be to accidently switch dongles with someone and not know it till you got home. You'd have to waste your time playing detective instead of spending your time sewing. Have you ever come across a sewing or embroidery pattern to meet the designer shortly after? 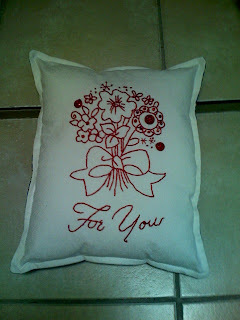 I found the Quilted Ladies embroidery patterns several months ago and have made several as gifts. Then in June I had the privilege of meeting the designer Bonnie Colonna and now I LOVE the pattern even more. Bonnie is one of the nicest people I have ever met in my life. She is kind, thoughtful, a really easy going fun person to be around. If you like to embroider and want a super fun quick project you should go to Bonnie's site and take a look at her quilted ladies. 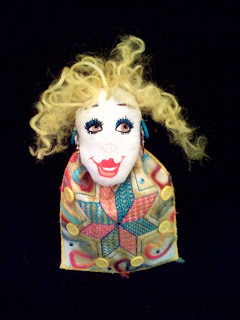 She has lots of different ones you can make and you can customize them as I did above.